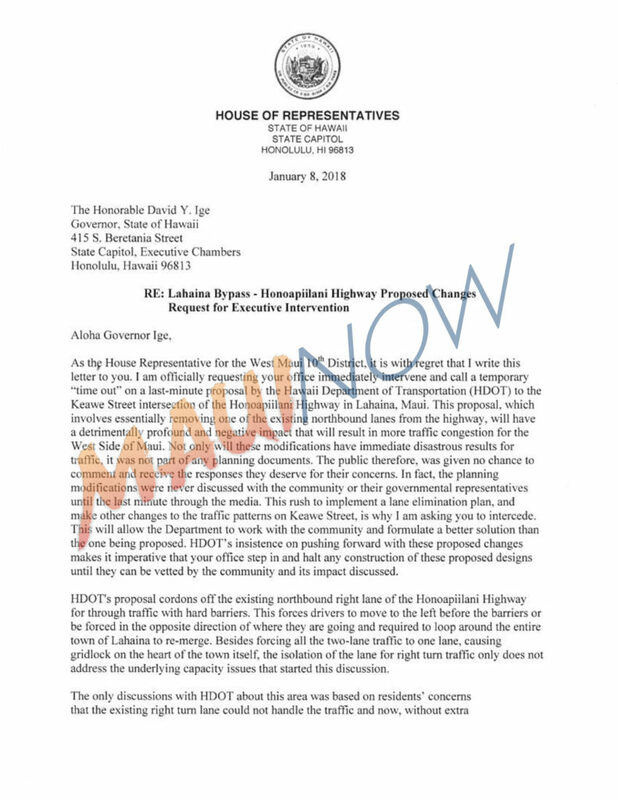 Rep. Angus McKelvey of Maui today reasserted his plea to halt last minute changes to the Keawe Street area of the Honoapiʻilani Highway after the Department of Transportation defended its stance in carrying out the project. 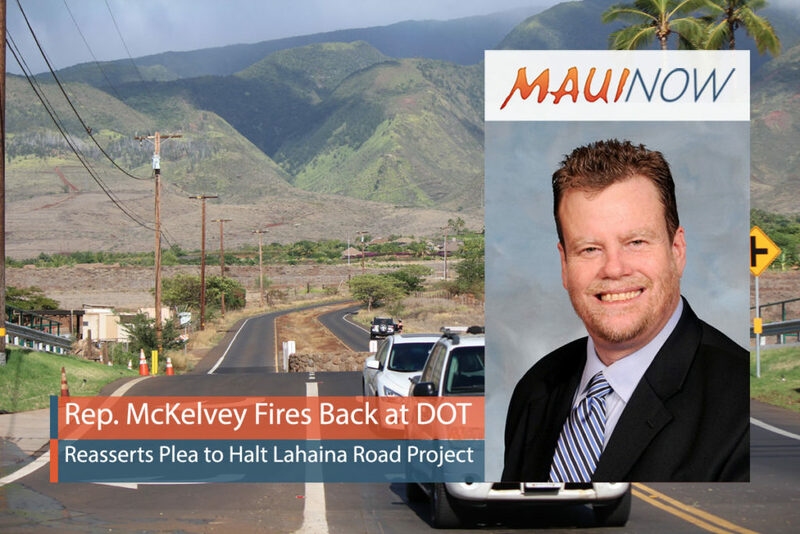 In a press release today, Rep. McKelvey expressed his disappointment calling the DOT’s response a “personal attack” against himself and the West Maui community. 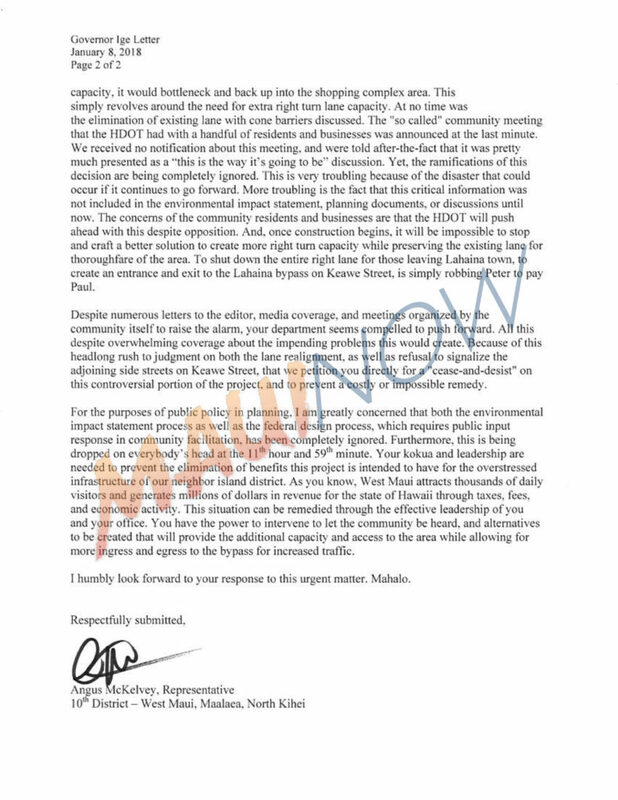 “I am morally outraged that a deputy director would resort to name calling in a response to letter from a lawmaker respectfully requesting that Governor Ige – the highest Executive Officer for the State of Hawaii – simply provide his kōkua and leadership,” Rep. McKelvey added. 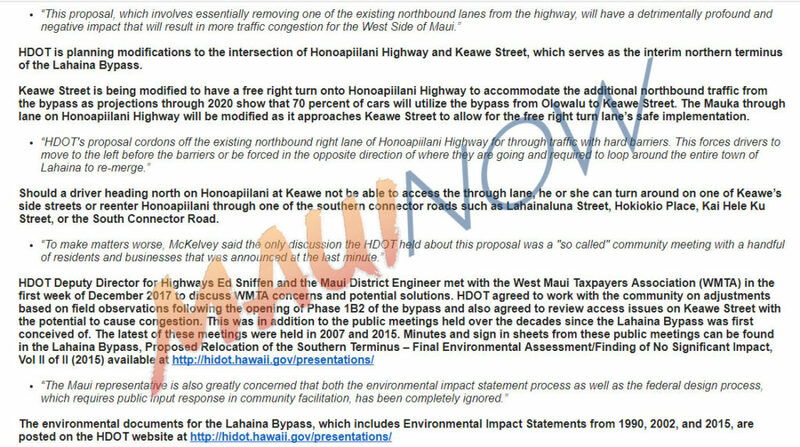 Rep. McKelvey further claims that the DOT “completely mixes apples and oranges” when it comes to the Environmental Impact Statement and the proposed changes for Keawe Street area of the highway. 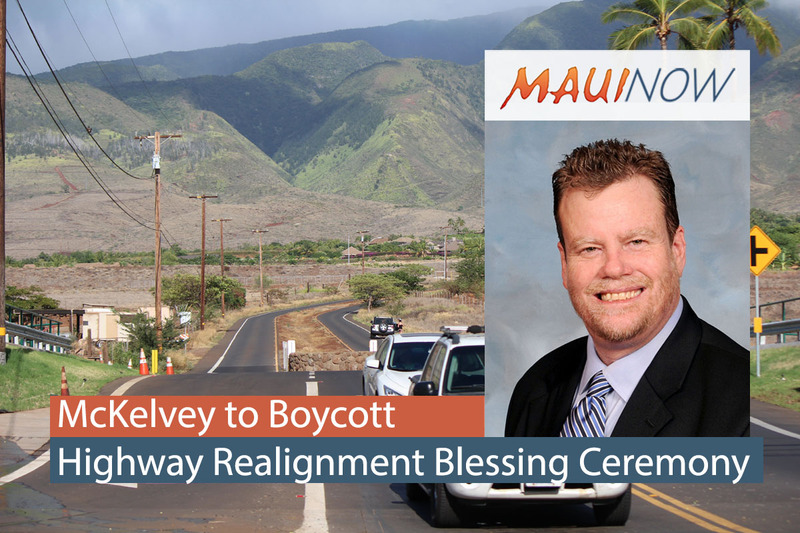 According to Rep. McKelvey, the EIS referred to by the DOT was completed in 2002 – long before Keawe Street existed and there were any homes, shops, or businesses on the corridor. *Below are copies of the letter sent from Rep. McKelvey to Gov. 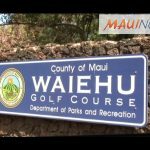 Ige on Jan. 8, 2018; and a press release issued by the state Department of Transportation on Jan. 11, 2018. 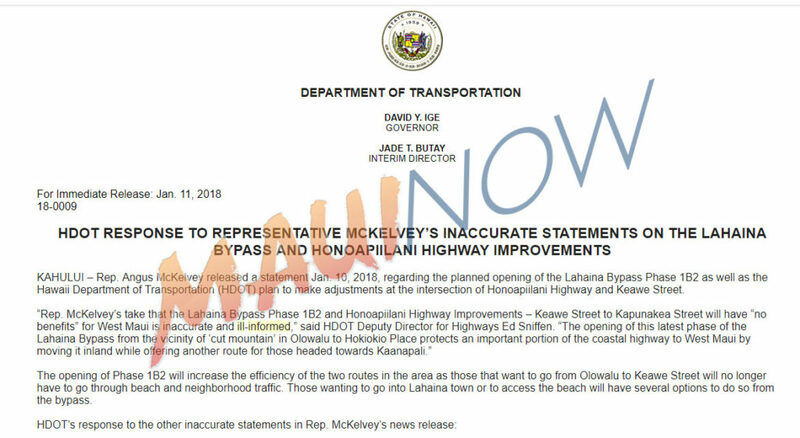 McKelvey calls on Governor to intervene on Lahaina roadwork. Page 1 of letter. 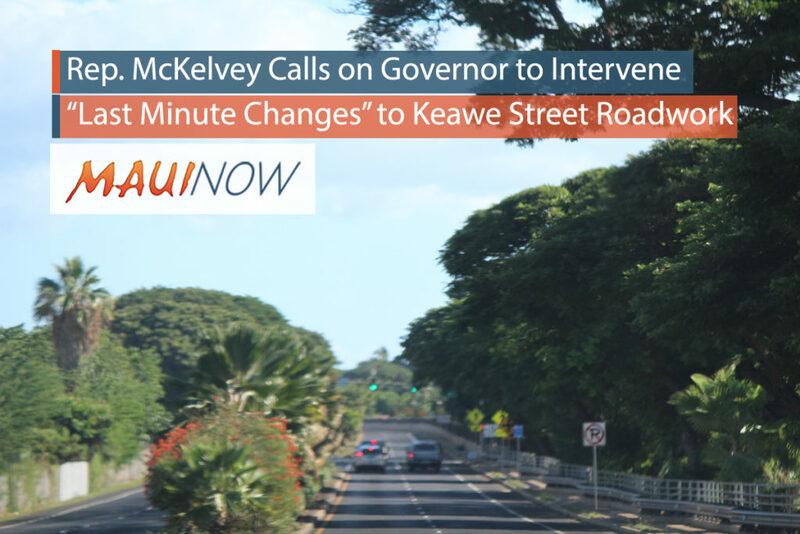 McKelvey calls on Governor to intervene on Lahaina roadwork. Page 2 of letter. 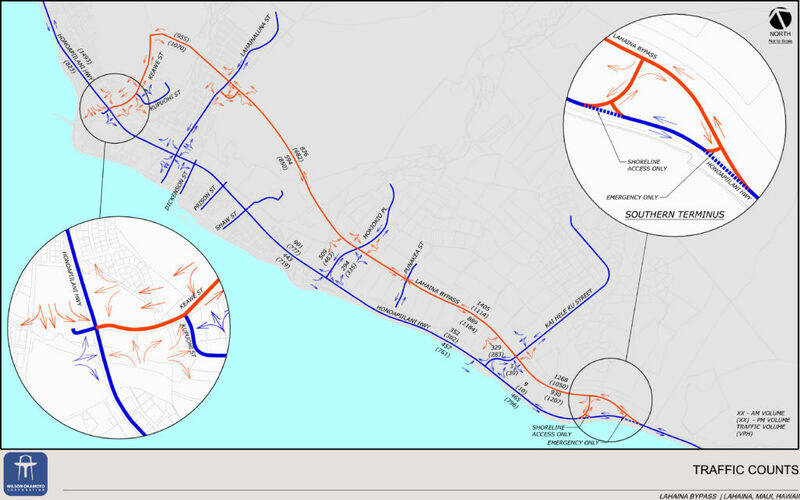 Lahaina Bypass diagram courtesy HDOT.